It's all about the sleeves lately, and the fashion trend shows now signs of slowing down. Here, ruffled bishop sleeves create a powerful silhouette. So cute. Fits very well. I recieved so many complements. Comfortable! 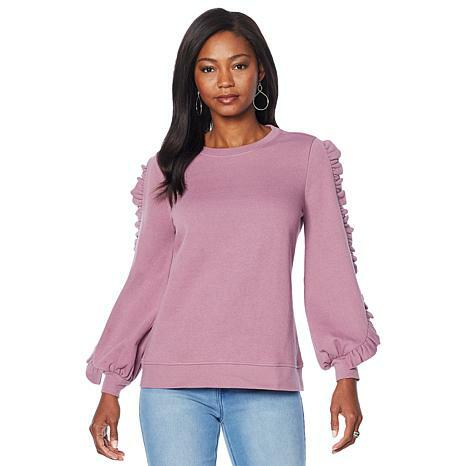 Receive lots of compliments all due to the ruffle on the sleeves. 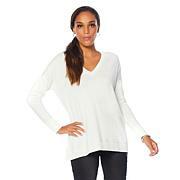 Love love love this dressy sweatshirt by Diane. Ordered in the Merlot red and its very flattering with my blonde hair. Looks great with DG2s twill denim jeggings in gray. The ruffle sleeve is very unique. Got many compliments from the younger crowd when I wore it. Be careful drying - shrink in length a little. Sleeves were a little short to begin with (Im 56 and wear XL). Definitely recommend! Ruffle Sleeve - Love it!!!! Love it! Received many compliments. Very comfortable and true to size. Looks great! I love everything about this top and even ordered a second one. I did order up one size and is perfect.